I find that, for most people, there is still something inherently captivating about the aerial view in photography. Perhaps it stems from a fascination with flight, a fear or awe of heights, or simply the novelty of seeing our world from an unusual perspective. No matter the reason, most of us do not seem to have developed a jaded post-postmodern attitude towards this “God’s-eye” view. 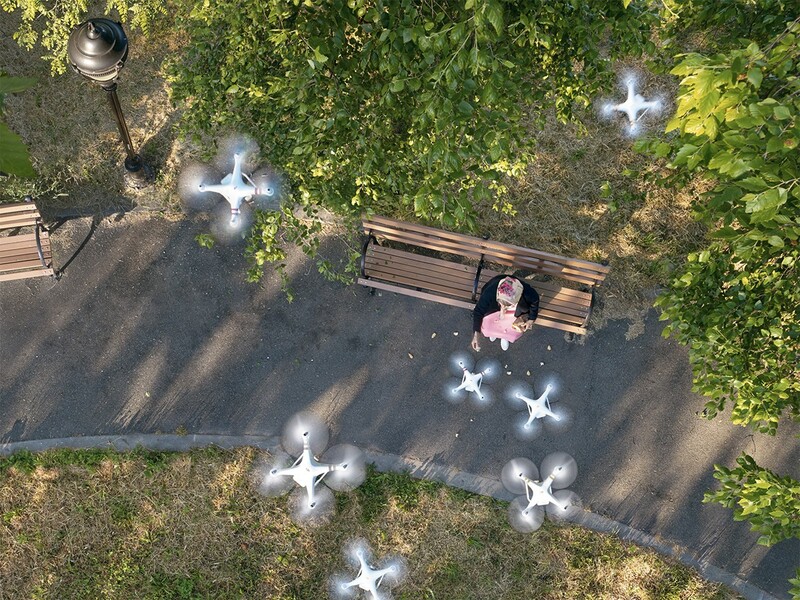 It remains to be seen whether or not this will change with drone photography becoming ever more accessible and common-place — I suppose the eye-rolls and deep sighs of over-saturation may still be forthcoming. “Boston, as the Eagle and the Wild Goose See It,” James Wallace Black, 1860, Albumen silver print from glass negative, image resides in the public domain. 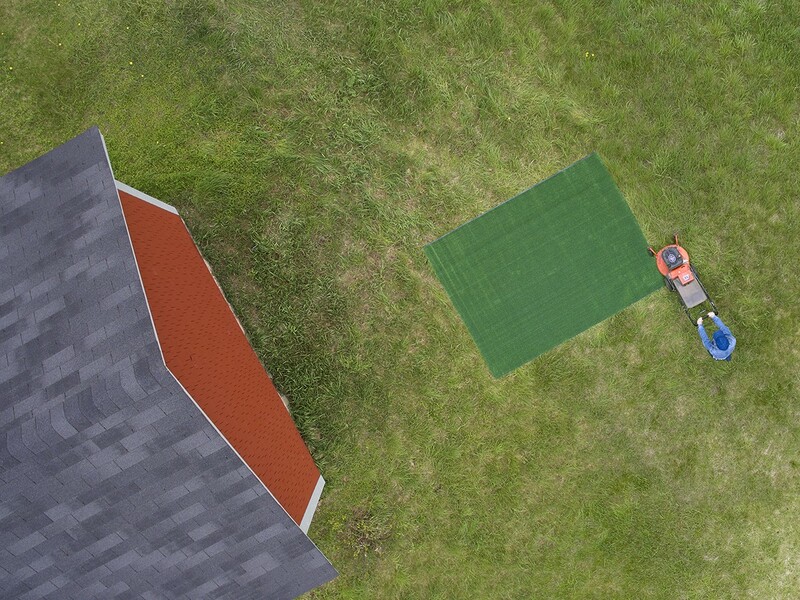 Another interesting thing about aerial photography is that we still tend to trust it as relatively objective. We can thank the scientific, military, and surveillance nature of the majority of historical and contemporary aerial imagery for that. 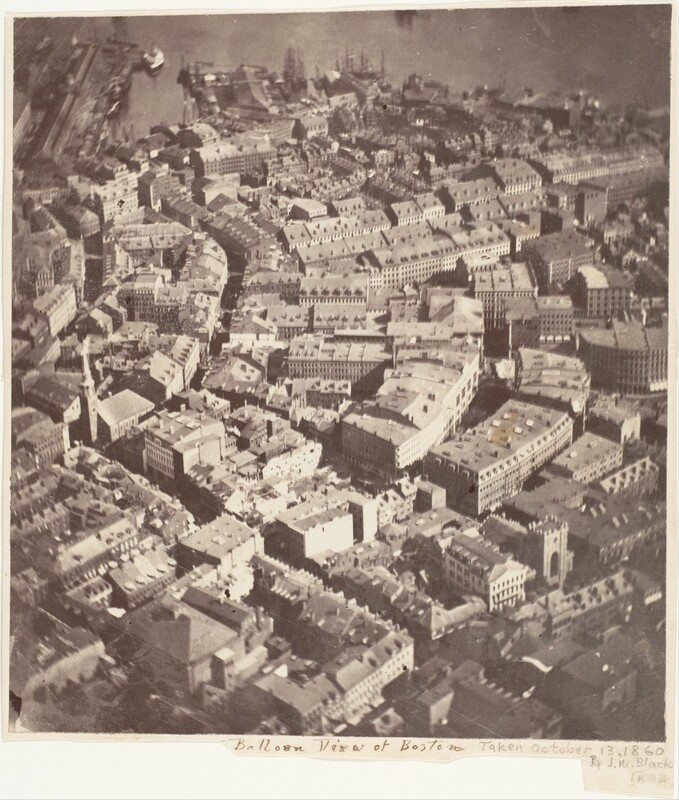 The oldest surviving aerial photograph, taken from a hot air balloon by James Wallace Black above Boston in 1860, has an objectivity that makes it feel like a scientific document even as its title, Boston, as the Eagle and the Wild Goose See It, captures the imagination. Since Felix Nadar’s and James Wallace Black’s early experiments with hot air balloons, cameras have been attached to everything from kites, rockets, pigeons, and, of course, manned and unmanned air crafts such as airplanes, helicopters, satellites, and drones in the service of research, news reporting, reconnaissance, surveillance, and the like. 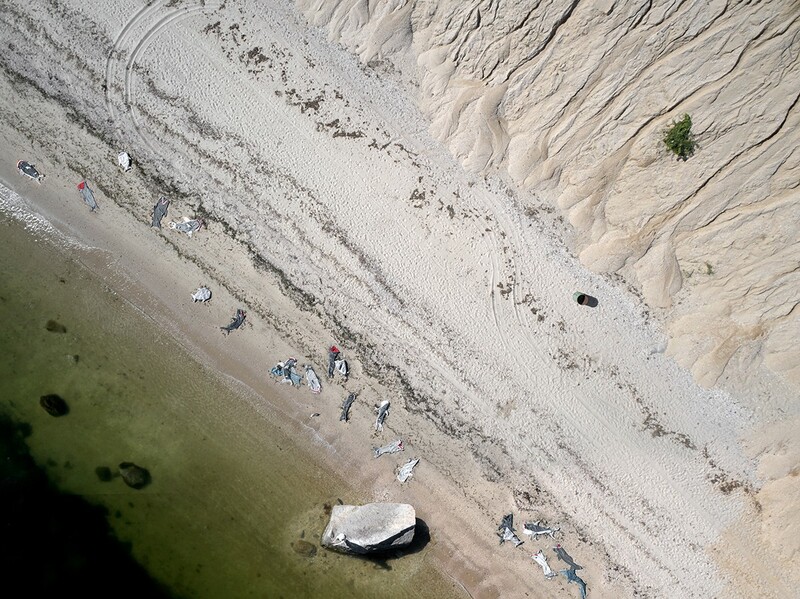 Even most artists known for aerial photography, such as William Garnett, Georg Gerster, Marilyn Bridges, Michael Light, and David Maisel seem to use photography “truthfully,” albeit often in an abstracted, critical, and/or conceptual way. In many of these photographs, Walter takes the constructions to the level of the absurd. For example, in “Swan Lake,” it doesn’t take much more than a cursory glance for the viewer of the photograph to realize something that the figure in the photograph seems to miss. 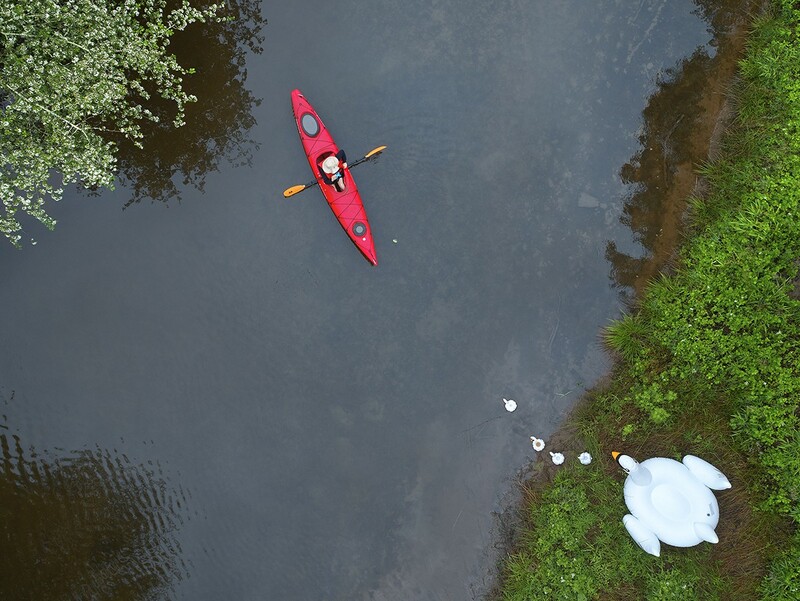 From our vantage point, it is clearly evident that those are plastic, inflatable pool toys, not real swans, but the figure in the kayak seems to be intently studying these creatures with her binoculars, perhaps making a mental note to add them to her birding “Life List.” In this and many other of her photographs in this series, Walter seems to be calling out the absurdity of the denial of climate change and the inevitable tragic end in which we will need to replace nature with artificial substitutions. “Swan Lake,” © Margeaux Walter, 2017, from the series Believe Me, image provided courtesy of the artist. 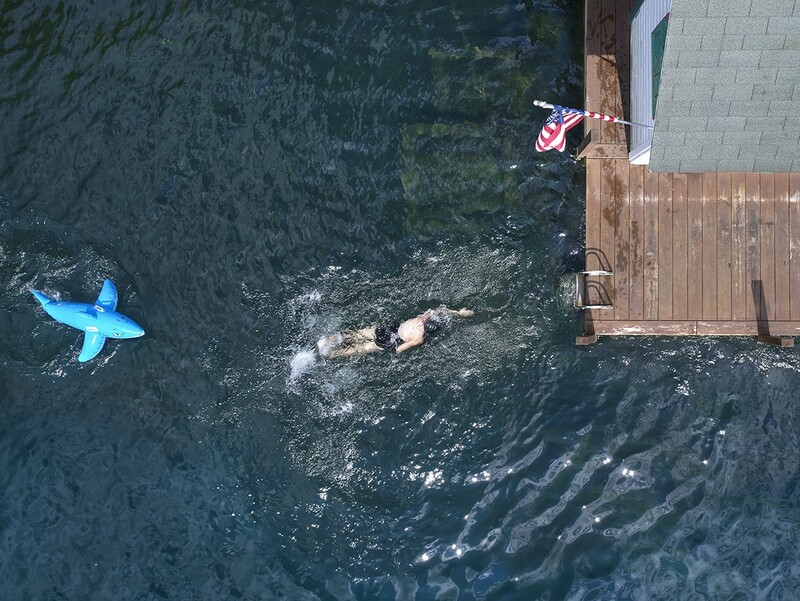 Other examples of this can be seen in “Island,” in which a banana tree has been replaced by an umbrella, “Pursuit,” in which a shark has been replaced by another pool toy, “Grass is Greener,” in which mowing the grass causes it to turn into the “superior” product of artificial turf, and, most effectively, and chillingly, in the cleverly titled “El Fin,” in which stuffed animal sharks have been finned, de-fluffed, and discarded along the shoreline. 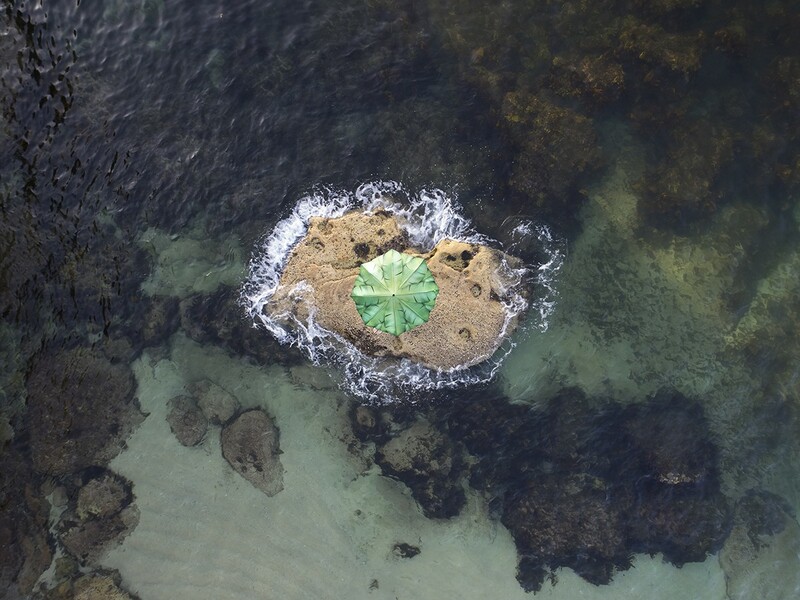 “Island,” © Margeaux Walter, 2018, from the series Believe Me, image provided courtesy of the artist. “Pursuit,” © Margeaux Walter, 2017, from the series Believe Me, image provided courtesy of the artist. “The Grass is Greener,” © Margeaux Walter, 2017, from the series Believe Me, image provided courtesy of the artist. 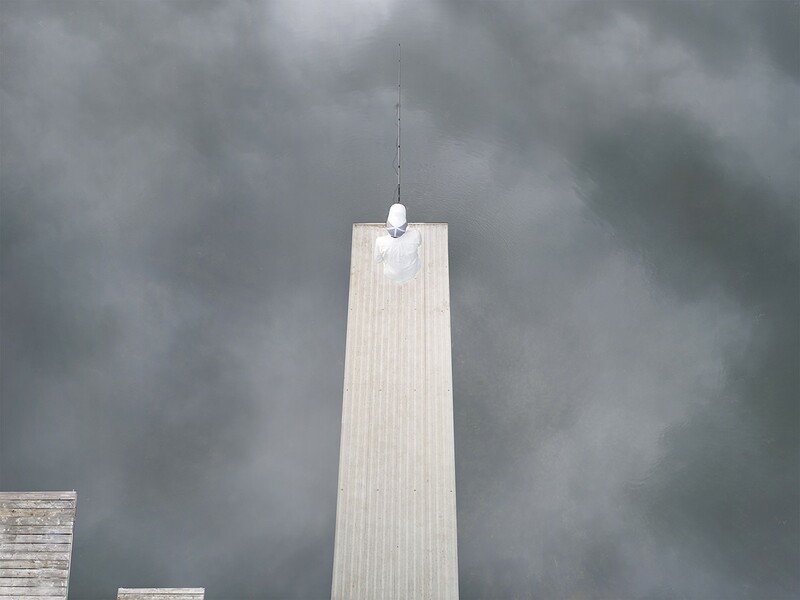 “El Fin,” © Margeaux Walter, 2018, from the series Believe Me, image provided courtesy of the artist. 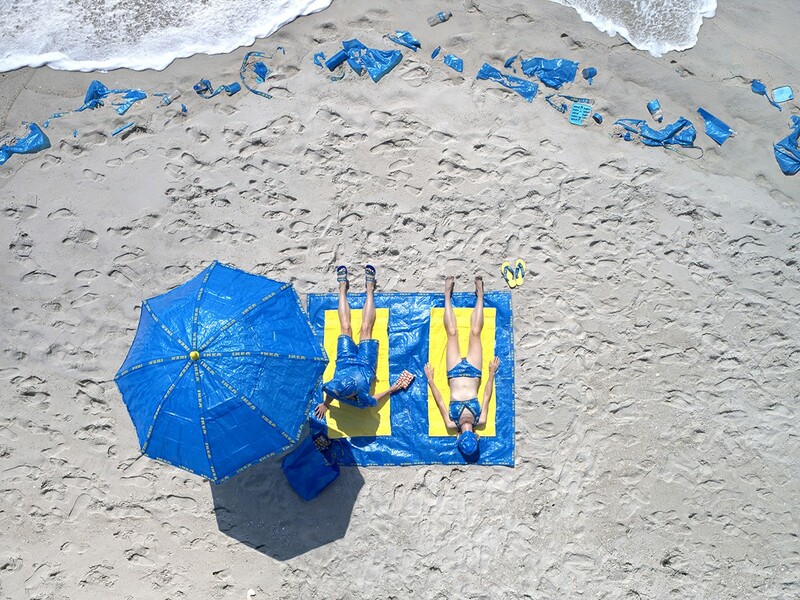 Walter references consumerism, waste, and conformity in photographs like “Some Assembly Required,” in which everything in this beach scene, including the seaweed at the shoreline, has been replaced by items from Ikea. 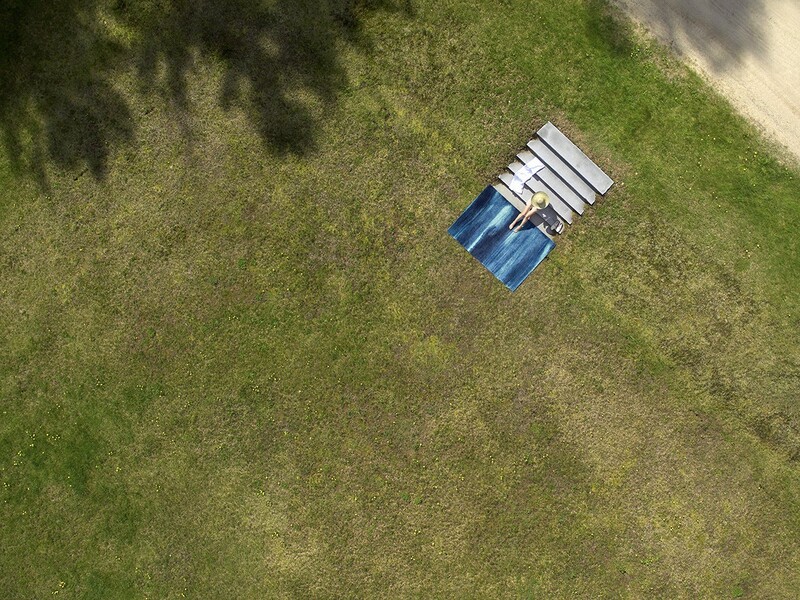 Similarly, in “Off the Deep End,” the pool the figure is sunning herself in front of has been replaced by a consumer item, an Ikea rug. “Some Assembly Required,” © Margeaux Walter, 2018, from the series Believe Me, image provided courtesy of the artist. “Off the Deep End,” © Margeaux Walter, 2017, from the series Believe Me, image provided courtesy of the artist. Walter is also commenting on the anonymity of our everyday lives, especially in terms of surveillance and digital culture. Although all the figures in these photographs are self-portraits, from this vantage point, she is not recognizable as anyone specific. She is not an individual; she is at once playing everyone, but is no one. As in much of her work, she is commenting on the “fragility of identity, and the role that photography plays in our ability to remember and create a self-image. 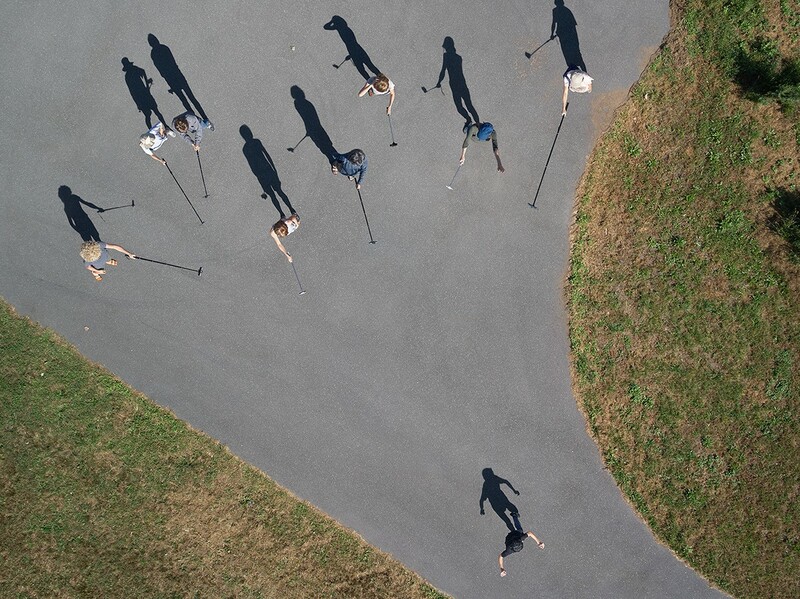 Hiding is becoming harder, and at the same time so is being seen.” In many of these photographs, she is playing with camouflage, not only as a reference to the military history of aerial photography, but as a way to reference this notion of visibility/invisibility in today’s digital culture. In “Don’t Feed the Birds,” she seems to be admonishing us not to support (“feed into”) the ubiquity of surveillance, as well as referencing the idea that we are replacing the natural world with human-made substitutions. “Don’t Feed the Birds,” © Margeaux Walter, 2018, from the series Believe Me, image provided courtesy of the artist. “XO,” © Margeaux Walter, 2018, from the series Believe Me, image provided courtesy of the artist. “Cog in the Machine,” © Margeaux Walter, 2018, from the series Believe Me, image provided courtesy of the artist. 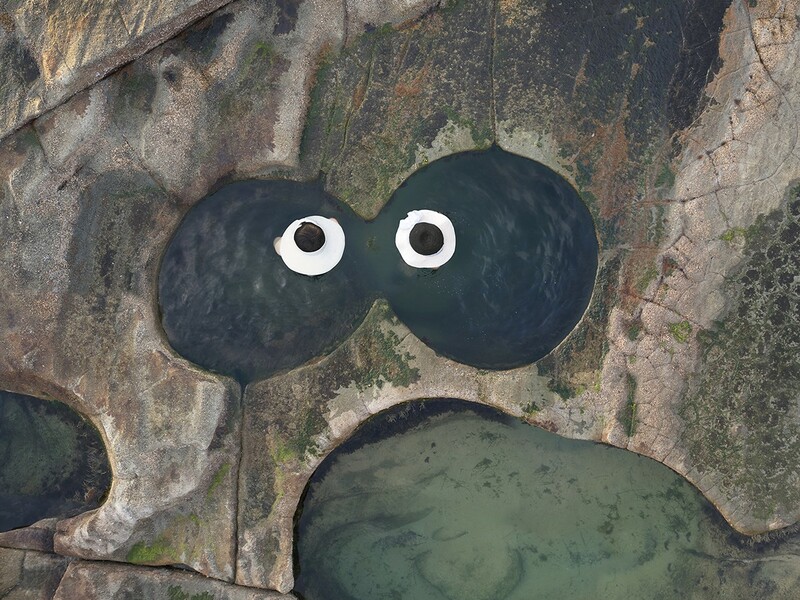 “Googly Earth,” © Margeaux Walter, 2018, from the series Believe Me, image provided courtesy of the artist. 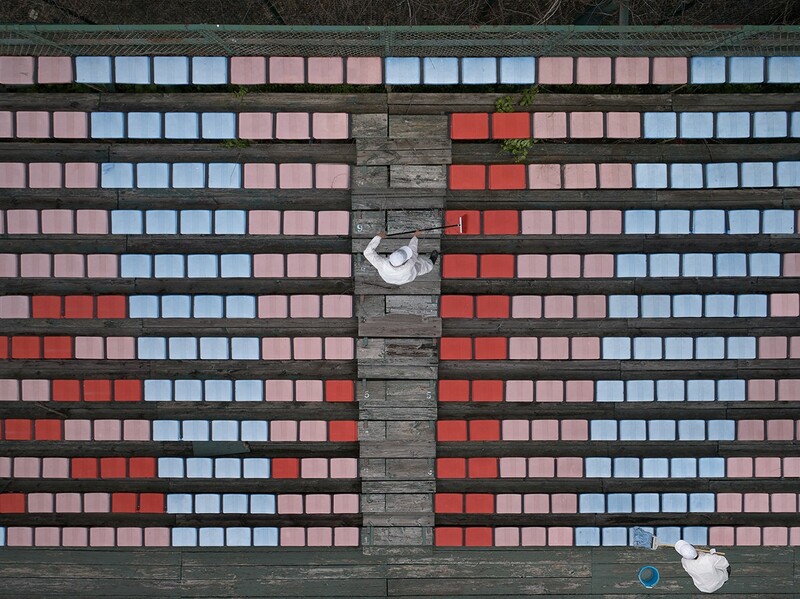 Walter also employs visual puns and twists in perspective and scale in many of these pieces, not only in humorous ways that draw the viewer in, but in order to reference the way in which images can be read and interpreted in different ways and to encourage viewers to examine the photographs more carefully. For example, in “Hang Loose” and “High Rise,” it takes careful observation to discern the vantage point, which seems to flip between an aerial and frontal view. 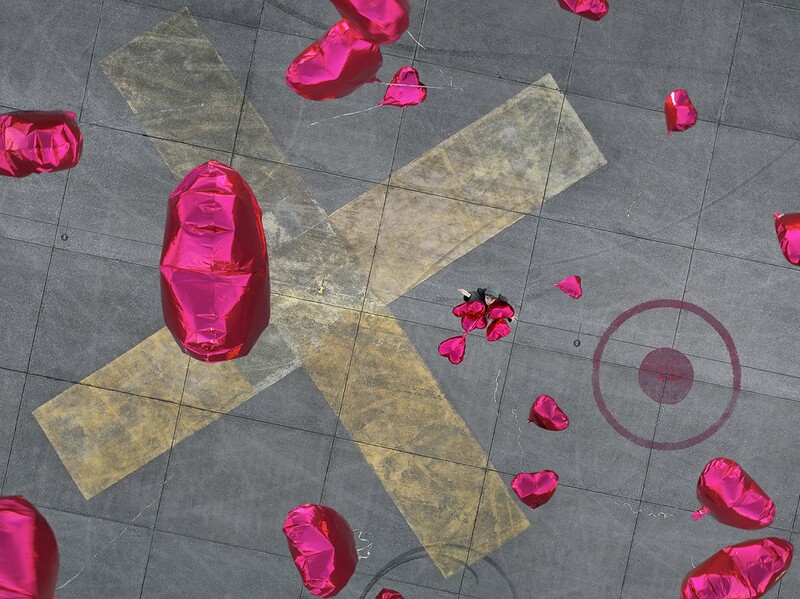 “X Marks the Spot” uses a play of scale to combine a childish innocence with a more violent mark. 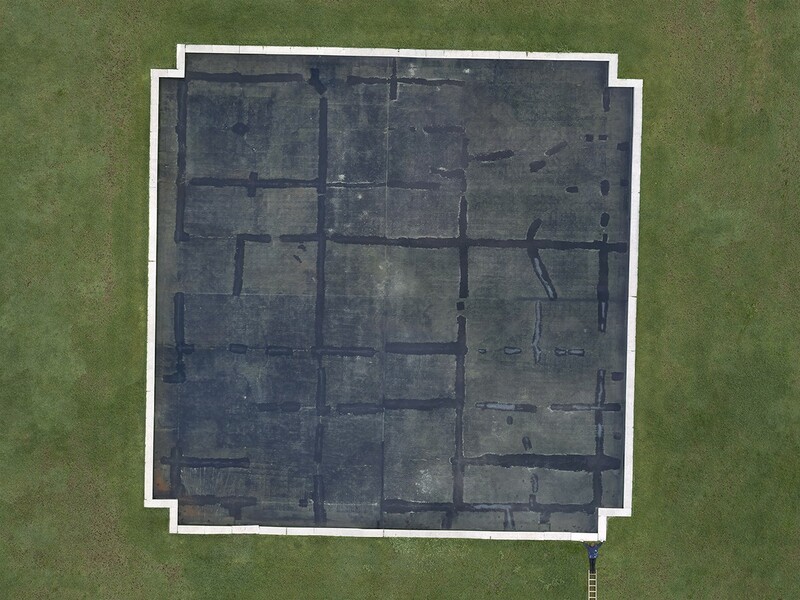 “Composition in Blue” is a clever twist in scale in which the viewer eventually realizes that the roof top resembles an abstract painting that the diminutive figure is trying to straighten out. 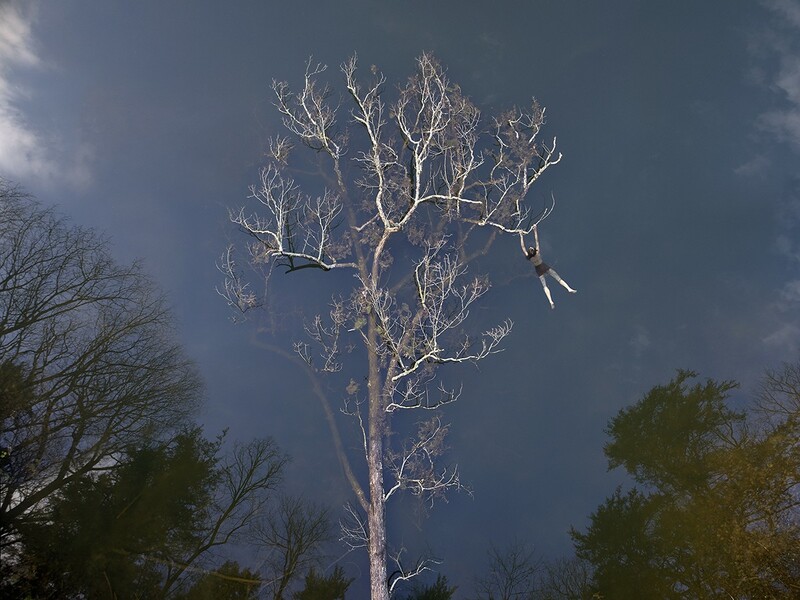 “Hang Loose,” © Margeaux Walter, 2018, from the series Believe Me, image provided courtesy of the artist. “High Rise,” © Margeaux Walter, 2018, from the series Believe Me, image provided courtesy of the artist. 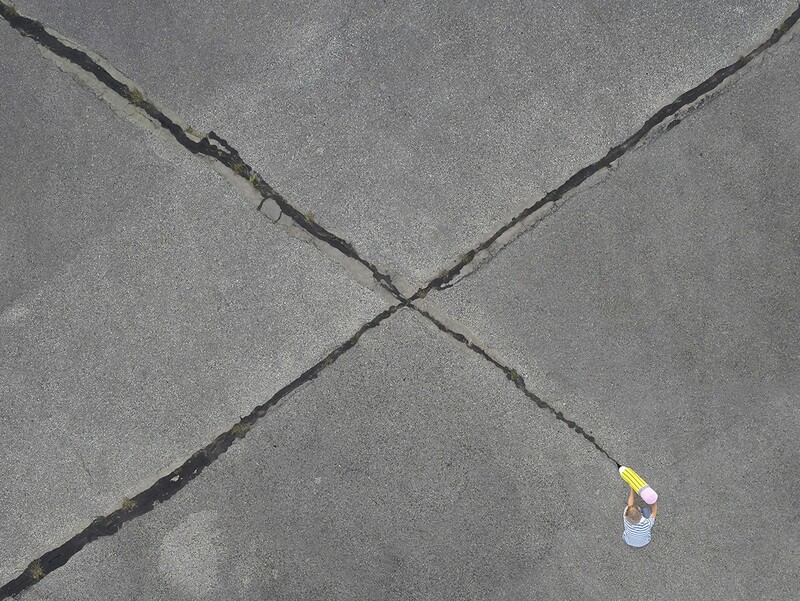 “X Marks the Spot,“ © Margeaux Walter, 2017, from the series Believe Me, image provided courtesy of the artist. “Composition in Blue,” © Margeaux Walter, 2018, from the series Believe Me, image provided courtesy of the artist. As with most photographs in general, Walter’s works in this series are best enjoyed and fully understood as large-scale prints, where the viewer can examine the meticulously-crafted details and spend the time and energy to contemplate them. I must admit that I missed the brilliance of what later became my favorite of Walter’s pieces in this series until I had come back to the piece a number of times. At first glance, I thought the mob in “Capture” was carrying golf clubs or maybe even metal detectors. When I finally realized that they were holding up selfie sticks, I realized that the scene she created here is a wonderful contemporary allegory in which the lone figure thinks that the mob is coming after him/her, but they are actually just obsessed with “capturing” themselves. “Capture,” © Margeaux Walter, 2017, from the series Believe Me, image provided courtesy of the artist. To fully appreciate Walter’s work in person, I highly recommend visiting her solo show at the Butler Institute of American Art in Youngstown, OH through January, 2019. She also has a two-person show coming up in November at Foto Relevance in Houston, TX. Amanda Dahlgren is a San Diego-based photographic artist whose work opens dialogues about the way we live as a society and what we choose to value. Her work has been featured in exhibitions throughout the US and in print and online publications. Amanda is also an educator and mentor whose mission is to challenge and inspire everyone in her care to find powerful and authentic ways to express themselves through the photographic arts. 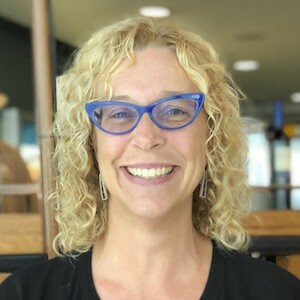 Amanda is currently an Adjunct Assistant Professor at Grossmont College, a Gallery Educator at the Museum of Photographic Arts, Co-Lead Producer for Open Show San Diego, Contributing Writer for Lenscratch, and Chairperson for the West Chapter of the Society for Photographic Education. Amanda Dahlgren is a San Diego-based photographic artist whose work opens dialogues about the way we live as a society and what we choose to value.